Boeing’s CEO spoke with Trump by phone on Tuesday morning. U.S. lawmakers of both parties called Tuesday for the Federal Aviation Administration to join a growing list of governments in grounding Boeing’s beleaguered 737 MAX 8 jetliner — a step that would threaten major disruptions of some domestic air traffic and one of the nation’s top manufacturers. The pressure from members of Congress, labor unions and dozens of countries and foreign-based airlines is leaving the FAA increasingly isolated, a day after the agency said it’s awaiting more information about the Ethiopian Airlines crash that killed 157 people Sunday, including eight Americans. Though the cause of the crash has not been determined, it bears similarities to an October air disaster in Indonesia in which 189 people died, raising questions about whether a Boeing stall-prevention system on the MAX 8 sent the plane into a fatal dive just after takeoff. President Donald Trump spoke with Boeing CEO Dennis Muilenburg on Tuesday, a source familiar with the conversation told POLITICO, in a sign of the high stakes involved for the company and the U.S.
Boeing said Muilenburg stressed to Trump that the 737 MAX is safe. An administration official later said the White House has been in “constant contact” with the FAA about the issue. Six years ago, the Obama administration’s FAA had ordered the temporary grounding of another Boeing plane — the 787 Dreamliner — amid questions about a spate of fires linked to its lithium ion batteries. Sens. Elizabeth Warren (D-Mass.) and Mitt Romney (R-Utah) said Tuesday that the FAA shouldn’t wait for answers before taking the MAX 8 out of service — echoing similar statements Monday from Sens. Richard Blumenthal (D-Conn.) and Dianne Feinstein (D-Calif.). Meanwhile, the European Union, the United Kingdom, Ireland, France and Germany became the latest governments Tuesday to jump into the fray, barring 737 MAX planes from their airspace. They joined a flood of other nations that have barred the Boeing jet, including China, Australia, Malaysia, Oman and Singapore, as well as airlines based in countries such as Mexico, Norway and South Korea. Seven British, seven French, five German and one Irish citizen were among those killed in the Ethiopian Airlines crash. The cascade of groundings represents a break from decades of other countries largely following the FAA’s lead on the safety of U.S. aircraft. It comes just two years after the global aviation industry registered its safest year ever, with no passenger jet fatalities reported anywhere in the world in 2017 — a feat for which Trump claimed credit last year. But fatal airline accidents still occur despite being far less frequent than in decades past. Last year, a Southwest Airlines passenger died after being partially sucked out a window on a Boeing 737 whose engine had fallen apart during a New York to Dallas flight. Investigators are also trying to determine the cause of crash in February of a Boeing 767 cargo plane outside of Houston that killed all three pilots on board. An initial investigation turned up signs that the crash might have been intentional. The crashes in Ethiopia and Indonesia bore unnerving likenesses to each other, with both involving new aircraft with experienced pilots that plunged into the earth soon after takeoff. A preliminary investigation of October’s Lion Air crash in Indonesia raised questions about a new Boeing safety feature that could have forced the plane’s nose down despite the pilots’ efforts to right its course — as well as complaints from pilots’ groups that the manufacturer failed to ensure that airlines knew about the change in technology. 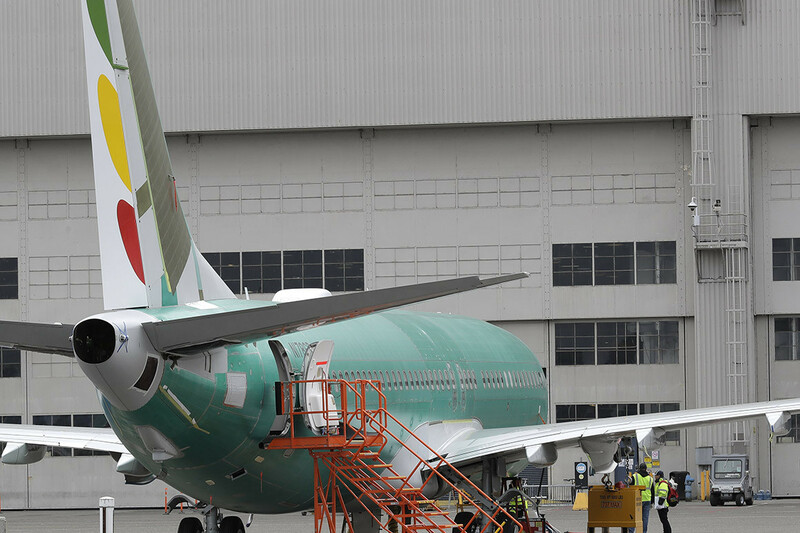 Boeing and the FAA have said they’re working together on a software update, but in a bulletin Monday, they said it would not be implemented until April. But the White House did not take a stand on whether the FAA should order the 737 MAX grounded. “We are going to be in constant contact through the Department of Transportation, the FAA, to make determinations at the appropriate time,” press secretary Sarah Huckabee Sanders told Fox News on Tuesday. “I want people to be assured that we take these accidents very seriously,” she said. The FAA is so far sticking to its position that it’s too soon to declare the plane unsafe to fly. “[T]his investigation has just begun and to date we have not been provided data to draw any conclusions or take any actions,” the agency said in a notice Monday. Some lawmakers were standing by the FAA’s position. The MAX 8 is a variation on the 737, the most widely sold jetliner in the world, and is a significant money-maker for Boeing, with thousands of the planes on order to airlines around the world. The plane is intended to be a fuel-efficient competitor to the already more-popular Airbus A320neo, which may well pull even further ahead amid the ongoing turmoil. It’s also a significant part of the fleets of Southwest and American Airlines, which have about 60 of the Max 8 planes between them. Boeing said Tuesday that “we have full confidence in the safety of the 737,” despite the growing number of countries abandoning its plane. But not all employees of the airlines are feeling reassured. The Transport Workers Union of America, whose 150,000 members include aircraft mechanics, baggage handlers and flight attendants, said it too was urging the grounding of the plane “in an abundance of caution” until the cause of the two crashes has been determined. “People must always be put over profits,” the union tweeted at the FAA. Kathryn A. Wolfe, Brianna Gurciullo, Stephanie Beasley, Rebecca Morin, Andrew Restuccia and Saim Saeed contributed to this report.